Etihad Stadium, also known as Eastlands, was built for the 2002 Commonwealth Games. 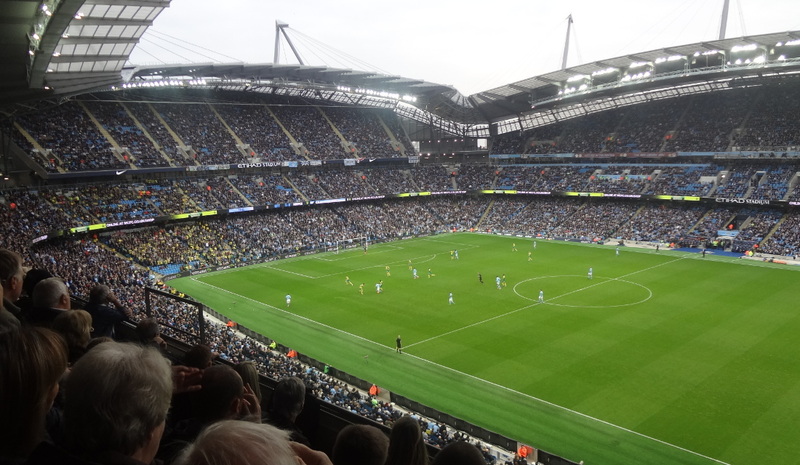 Following the games, the stadium was converted into a football stadium as to provide Manchester City with a modern replacement for Maine Road. The club moved into Etihad Stadium at the start of the 2003-04 season. In 2008, Etihad Stadium hosted the UEFA Cup final between Zenit St Petersburg and Rangers FC (2-0). The stadium was initially called City of Manchester Stadium, but was renamed Etihad Stadium in 2011 following a 10-year sponsorship deal with Etihad Airways. At around the same time, Manchester City started to conduct feasibility studies into expanding the stadium, first considering ambitious plans to raise the roof and add a complete third tier, but eventually settling on just adding additional tiers to the stands behind the goals. In the summer of 2014, works started on expanding the South Stand with an additional tier, which boosted capacity with 6,000 seats. At the same time, the club announced plans to add a further 3 rows of seating pitchside, which brought total capacity to over 55,000 seats for the start of the 2015-16 season. If there is sufficient demand, the club may add a third tier to the North Stand as well, which will raise capacity to an approximate 61,000 seats. Etihad Stadium is located toward the east of Manchester at about 1.5 miles from Manchester’s city centre and slightly less from Manchester Piccadilly Station. The walk from the city centre to the stadium takes about 30 minutes, and that from Manchester Piccadilly Station 25 minutes. Follow the City Link signs. It is quicker though to catch the metrolink from either Piccadilly Station or – for example – Market Street in the city centre. Take a train in the direction of Droylsden and get off at stop Etihad Campus right next to Etihad Stadium. The journey takes 8 to 10 minutes. Alternatively, there is a large number of buses that serve the stadium, e.g. line 53, 54, 185, 186, 216, 217, 230, 231, 232, 233, 234, 235, 236, 237, X36 and X37. After the match buses to the city centre will depart from Ashton New Road next to the South Stand. The area around the Etihad Stadium is not one of the best of Manchester, and apart from the odd pub there are few options for eating and drinking. The city centre is at walking distance though, and one can therefore just as well eat and drink there and then walk or take the metrolink to the stadium. There are some bars around Piccadilly Station, closest to the stadium, but other nightlife areas such as the Northern Quarters, The Printworks (both north of the center), Deansgate Locks (south), or around the Town Hall are not too far away either. There are no hotels directly near the Etihad Stadium, but there is an Ibis Budget at an approximate 10-minute walk towards the centre. 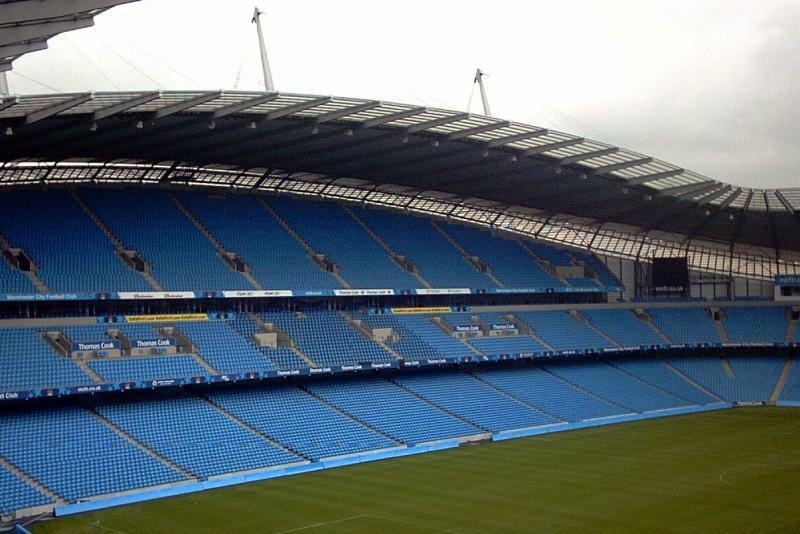 Click here for an overview of hotels near the Etihad Stadium. Alternatively, there are plenty of options near Piccadilly Station, though most come in the high-end category. The Portland by Thistle, Premier Inn, Britannia Hotel, and Mercure are some of the cheaper options. Of course, there are plenty of options elsewhere in the centre, and the stadium is easily reached by public transport. Click here for an overview of all hotels in Manchester. Tickets for Manchester City games can be bought online, or by phone +44 (0) 161 444 1894. While Man City does sell out most high-profile matches, tickets for most other matches are rather easily available, especially if booked in advance. Ticket prices depend on the opponent with those for the least interesting fixtures starting at £35.00 for a lower-tier seat behind the goal and those for the highest-profile opponents starting at £57.00. If the match is sold out, you can get hospitality tickets through either viagogo or Stubhub. These tend to be rather reasonably priced so are even worth a shot if you fancy trying out a slightly upgraded experience. For more information call +44 (0) 161 444 1894 or email tickets@mcfc.co.uk. Manchester City offer guided stadium tours around the Etihad Stadium, that include visits to the dressing room, players’ tunnel, directors’ box, press conference room, and the dug outs. The tours last approximately 70 minutes. Tours run every day of the week between 10:30 am and 3:30 pm (3:00 pm on Sundays), though different schedules can apply, in particular on matchdays. Tours can be booked online, or by phone +44 (0) 161 444 1894. It costs £16.00. For more information email tours@mcfc.co.uk. Mcfc.co.uk – Official website of Manchester City. Visitmanchester.com – Official tourism website for Greater Manchester. TfGM.com – Manchester public transport maps, timetables, and fare information. Attended Taylor Swift concert, 9 June 18. I am a Villa fan this was my first visit. I cannot praise it enough. Everything is very well laid out and signposted. Special mention goes to the Man City stewards. They were exemplary, cheerful, helpful and enthusiastic and ready to help. Well done to all we had a great time. Just wish Villa were back in the premier so I could visit again soon. Went to a recent match. The stadium and the facilities are top class. The fan zone outside the stadium is the best I have been to. The Metrolink tram from the city centre has its own stop right next to the stadium. There are also special buses from the city centre on match days. You can even walk from the city centre in about 25 minutes. It is easy to to go a bar in the city centre then onto the stadium. Plenty of accommodation in Manchester with a good price range, but be aware that Manchester hosts a lot of events so do not leave it too late if you want a hotel room. On visiting the stadium for the 1st time last night to see Bon Jovi in concert. I must say a BIG thank you to your staff for relocating my seats with no fuss and lots of help, due to me being scared of heights and the seats we were allocated were up on the 3rd level. Stadium tour is great. You get to see all there is to see, very friendly guide and plenty of time and opportunity to ask your questions and pictures. Included in the price are some friendly trivia supplied by the guide about that other team from the same town. Be sure to present your tour ticket at the fanshop to get a 10% discount on your purchase!